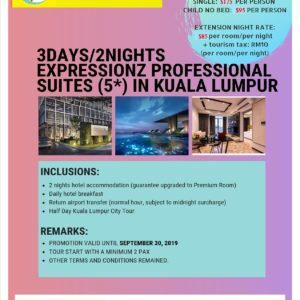 4 DAYS & 3 NIGHTS - HO CHI MINH VIETNAM - Smartway Travel and Tours, Inc.
On arrival at Tan Son Nhat airport, you will bemet and transfer to hotel for check in. Free at leisure. 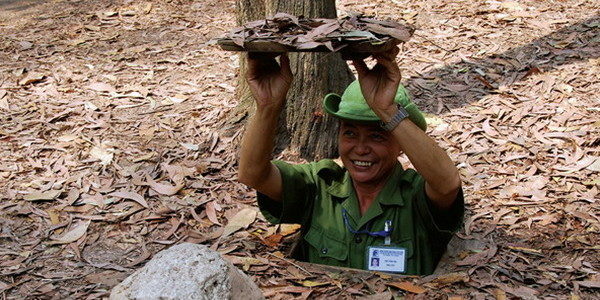 After hotel breakfast… Leave Ho Chi Minh City for Cu Chi Tunnels. On your way you will pass by paddy fields. Here you will have the opportunity to meet villagers and witness how rice paper is made. 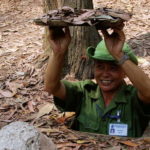 Explore the amazing labyrinth of tunnels used by the guerrillas during the war. Lunch will be served at local restaurant. 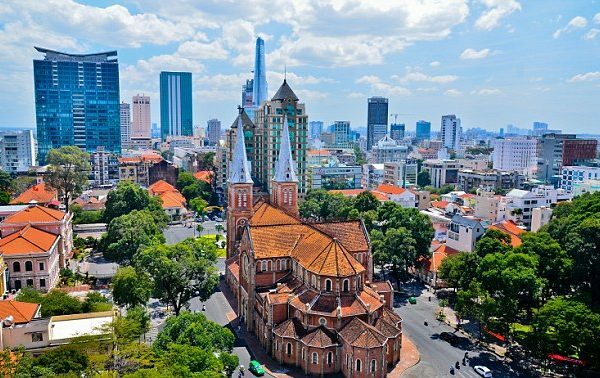 Transfer back to Ho Chi Minh City and start the trip for visiting Reunification palace which was the residence of the President of South Vietnam until end of the war in April 1975. Continue seeing some impressive French colonial structures including Notre Dame Cathedral, the Old Central Post Office & XQ embroidery workshop. 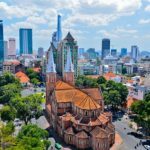 After visiting the City Hall, take a break-time at Ben Tanh Market or Saigon Square shopping central where anything and everything is for sales. Enjoy dinner at one of the good local restaurants. Overnight at the hotel in Ho Chi Minh City. After hotel breakfast. 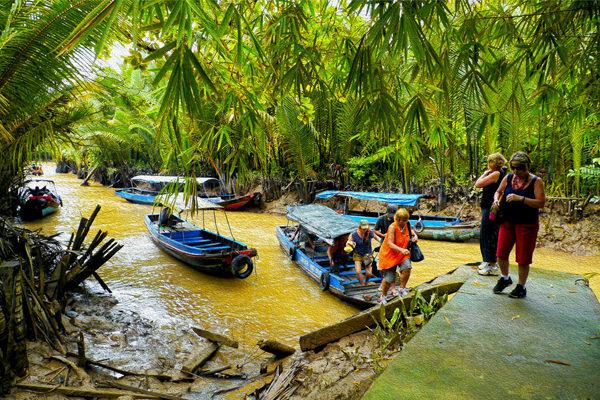 We will take a full day trip to the watery world of the Mekong Delta, just 1 hour and half by road from Ho Chi Minh City. We will have a full day trip here to catch a glimpse of the famous Mekong River. 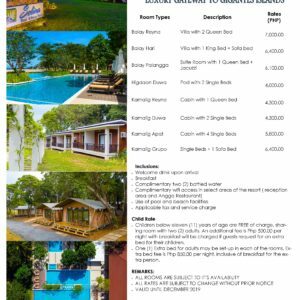 Upon arrival we will take a boat trip along narrow waterways overhung with dense vegetation visiting the fish whalf, the 4 famous islands of Dragon, Unicorn, Turtle and Phoenix. Then take a short tour to the bank of Mekong River visiting a rice farm, candy workshop and honey bee farm, then journey by sampan through the canals and mangrove forests where we watch the fisherman lay their fish traps.Enjoy time on the Unicorn Island visiting the local fruit., tea mixed with bee’s honey, and enjoy a locally produced folk show of traditional Mekong Delta music. Visit Vinh Trang Pagoda, the most famous pagoda in the south whose architecture is a mixture of Vietnamese, Kh’mer and Chinese. 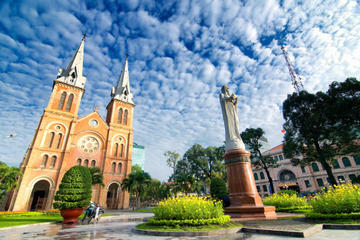 In the late afternoon, transfer back to Ho Chi MInh City. Enjoy your dinner on Saigon River Cruise Restaurant. Overnight at the hotel in Ho Chi Minh City. After breakfast at hotel. 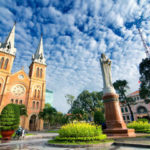 You will join a half day city tour with: War Remnants Museum the museum has a vast display of the both Indochina wars, China town, Thien Hau Pagoda. Lunch at Lion Buffet Restaurant.